I’ve been making a treat similar to this recipe for several years (found over at TheNourishingHome.com). I’ve tweaked it here and there…then sort of forgotten all about this great treat. Last week I decided I needed a lightly sweetened snack. Not salty. Not desserty. Not meaty. Just something filling and lightly sweetened. 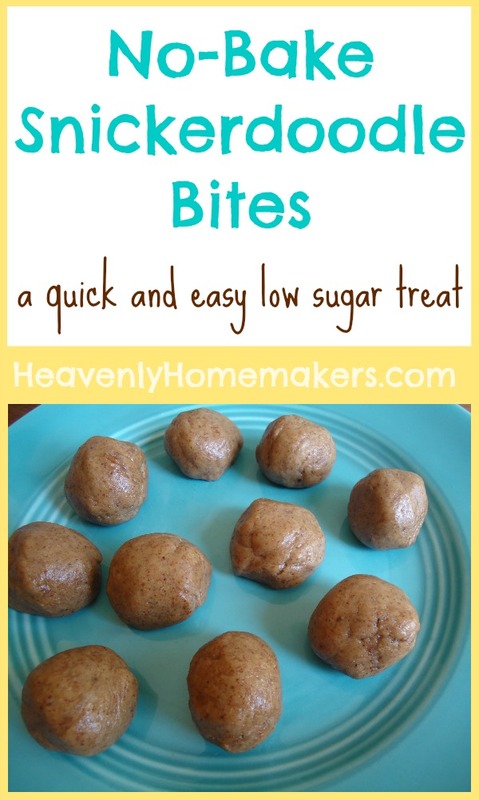 These Snickerdoodle Bites are perfect. I’ve kept these Snickerdoodle Bites in my fridge, grabbing one in the afternoon when I need a little something to get me through until dinner. Because these are made with coconut flour, they are filling and nourishing. And did I mention that they are lightly sweetened to perfection? Like, if they were produced in mass and put into a box, the box would definitely say, “Lightly sweetened…to perfection.” Yep, that’s what it would say. Mix the ingredients together in a bowl until well combined. Roll the mixture into teaspoon-sized (or whatever sized) balls. Refrigerate before serving - or just start eating because who can wait? Do feel free to add more honey if you prefer – although then these might be slightly more than lightly sweetened, thus ruining my description. But I’ll never know, so it won’t matter, and truly – we want these to be perfectly sweetened for your family’s delight. Coconut flour is naturally gluten free – a great option for those of you who must avoid gluten. Our family doesn’t not need to avoid gluten – however we like coconut flour because it is so rich in nutrients! “Coconut flour is the fiber from coconut meat after most of the oil has been extracted to make coconut oil.” (source: Tropical Traditions) Adding protein and fiber to our (lightly sweetened) snacks? Yes please! 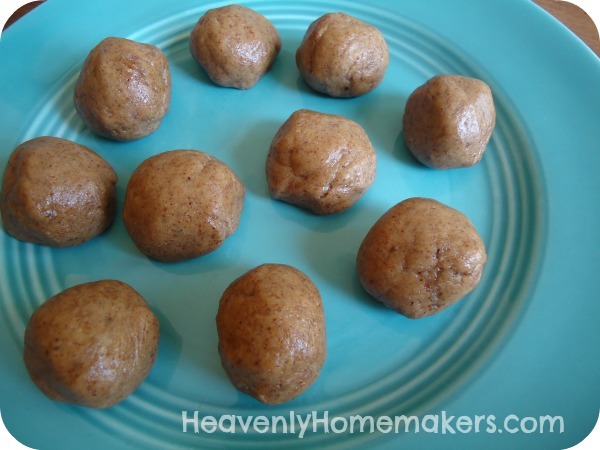 But right now, these lightly sweetened No-Bake Snickerdoodle Bites are my favorite coconut flour recipe. It’s probably because they only take 5 minutes to prepare and don’t require baking. And also because they are lightly sweetened to perfection. Are you a fan of coconut flour? How do you use it at your house? Went back and reread the snickerdoodle bite recipe, and had question about the raw flour….I don’t recall seeing a recipe using raw flour without baking it…..is raw flour good for you ? Just wondering….. I don’t like recipes using raw eggs……I just avoid those recipes….just not a fan of raw eggs….do you know Laura or any of your readers ? Mmmm…. This looks really good! And easy too. I may have to try this when I get the kids down for a nap. Oh, yum! I always forget about the coconut flour in my pantry. I will definitely make these in a week or 2. We have 3 birthdays this week so we’ll have more than our fill of sweets. Looking forward to sharing these with my children as an after-swimming snack. They are starving when they get out of the pool!! I am so grateful that you posted this quick, easy little gem of a recipe! They are wonderful! I don’t care for coconut flour, but I can’t taste it at all in these. Thanks again! I will probably be making these for the rest of my life! Oh, I may double the cinnamon next time – not sure. This snickerdoodle lover will be whipping these up this afternoon! I bought some coconut flour a while back, but just haven’t found a way to use it that we enjoy. I’m really excited to find a fun and tasty way to use it. And, thank you for adding a few more recipes for the flour. I think we’ll be hooked once we find a few recipes we enjoy. Made these today, not sure if I should thank you or not ????. How can you just eat one? Tried both your versions, YUM! I love this recipe as is, but had some pumpkin puree that I needed to use up, so I tried replacing half of the peanut butter with the pumpkin and it is delicious! Perfect fall treat! I have made this recipe so many times since you posted it as my family loves these. In fact, my two-year-old was just now begging for some but I only had two spoonfuls of almond butter left. I used one spoonful to mix up a mini batch very quickly, and he rolled those up into little worms. He’s much happier now after his snack. Thanks so much for the great idea! Sure, that substitution will be fine!